Mineral composition is the most important criteria in determining the therapeutic benefits of Dead Sea Bath Salts. The Healing Bath™ randomly tests its Dead Sea Bath Salts at an independent chemical laboratory to verify their mineral composition. This ensures our customers are receiving the highest therapeutic grade Dead Sea Bath Salt. 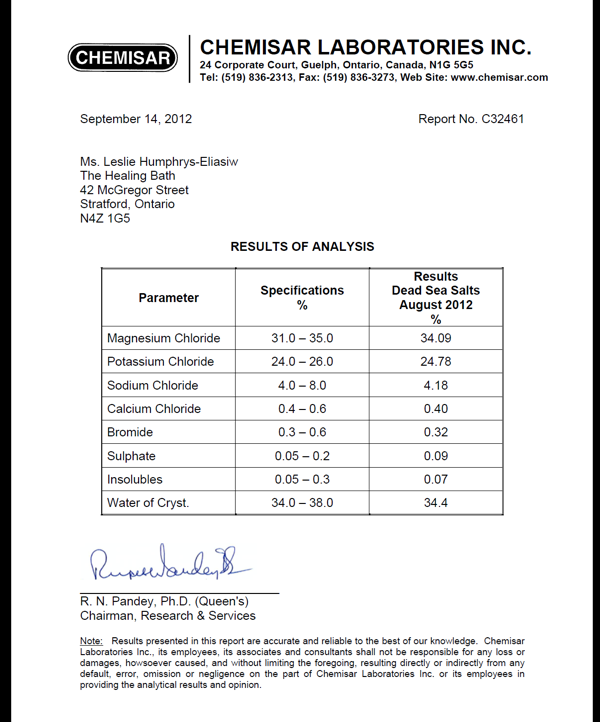 Here are the most recent lab results for our Dead Sea Bath Salts (September 14, 2012). For the actual PDF version of the Results of Analysis as issued by the lab, scroll down the page. nourishment and expel waste products. An imbalance in potassium often leads to water retention and muscle cramping. heart muscles and nervous system. Bromides – help relax and ease muscular aches and pains. They aid with the natural repair of the body and can also be used as a natural antibiotic. 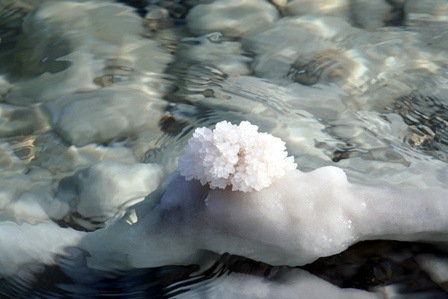 Bromide concentration in the Dead Sea is the highest of all waters on Earth. Sulphates – are necessary for the secretion of bile from the liver and for converting toxins into non-toxins. There are Dead Sea Bath Salts on the market today that are 99% sodium chloride (table salt). The seller may make all sorts of claims about the therapeutic benefits of their Dead Sea Bath Salts. In reality, however, the product they’re selling doesn’t contain any of those minerals as they were removed during processing in Jordan or Israel. Other than testing the product in an a lab (a costly undertaking) — before buying Dead Sea Bath Salts, always ask the seller for a chemical analysis of their salts as conducted by an independent chemical laboratory.